The Capt. couldn’t ignore the salmon jumping around the boat at Pavlof Harbor (link to Pavlof Cruise News post), he just had to go fishing. Wind had kicked up some chunky chop outside our protected anchorage so he settled for the calmer water inside the harbor. Did he plan to catch any salmon? It didn’t seem to matter; fishing was the activity of choice for the afternoon. We had fish in the freezer, fish in the fridge curing for lox, and had enjoyed fish for several meals already. He hooked three coho and brought one back to the big boat. Okay, I started one more batch of lox, and that left two nice tail pieces and some trimmings. The trimmings were tasty breakfast treats, the first batch of lox provided some lunch and appetizer snacks, and those two tail pieces didn’t warrant a barbecue preparation. Now what? It was time for a new experiment. My new cookbook, Dishes and Fishes, touted a fast broil in a superheated cast iron skillet. It was worth a try… it it failed we could always have popcorn for dinner. The cookbook recommended a simple salt and pepper coating, but noted the method also worked with marinated fillets. Good idea, I was in the mood for something Asian. It took a scant two hours of marinating in a mix of teriyaki/Ponzu/seasoned rice vinegar, followed by patting dry, and those tail pieces were ready to go. Accompanied by braised baby bok choy and white rice, this menu was voted a keeper. No, it won’t take the place of our favorite BBQ Salmon with Special Sauce, but it was awfully good for an easy meal. A short version of the directions: marinate the fish, heat a cast iron skillet at 500 for 20 minutes, dry the fish really well and place meat side down on the skillet. Place under the broiler and cook just until done. Specific directions?.... I'll insert them soon, at my next internet connection. We're back in town and wi-fi is alive again. Here's the promised update. It’s all about the method. Preheat the heavy cast iron skillet or grill pan, make sure the fish has been patted very very dry, and don’t overcook the fish. The method works well with almost any fish, marinated or not. If you have brined or marinated your fish, begin with step 2. Sprinkle the fillets with the salt and pepper; let rest at room temperature for 30 minutes or so. Work with a cast-iron pan just large enough to hold the pieces of fish you’re working with. Heat up the pan only under the broiler for 5 to10 minutes. The fish should end up about 4 inches below the element, so adjust your racks ahead of time. While the pan is preheating, pat the salmon fillets dry, very dry, rubbing off the marinade if you used any. Carefully pull the very hot skillet from the broiler; add the oil to the skillet and swirl it around. Place the pan back under the broiler for another minute to warm the oil. Remove pan from broiler. Quickly slide the skillet back under the broiler; cook for 4 to 6 minutes for thin pieces, or 8 to 10 minutes for very thick or larger pieces. Check the salmon mid-way through to make sure it’s not overcooking. Fish continues to cook for a few minutes after you pull it out of the oven, so remove it when the middle is still a little translucent (not raw). The salmon skin will be blackened and the flesh side should have an attractive sear, especially if you used a grill pan with ridges. Pull off the blackened skin and flip the fillets over to serve seared side up. The weather was good and the fishing was hot! We brought three large coho back to the big boat, large as in much larger than usual, not really really large like a king (chinook). Even the commercial trollers have commented on the size of the fish in this year’s run of silvers. Three big coho - that’s the good news. The freezer is almost full - that’s the not-so-good news. We need to eat a lot of fish before we go fishing again. We’re up to the challenge with barbecued salmon for dinners, salmon salad for lunches, and lox curing in the refrigerator for snacks and appetizers in the days ahead. There’s something special about freshly caught salmon, grilled to perfection on the barbecue, basted and topped with our not-so-secret sauce. I know some cooks swear by a pure approach, using only salt and pepper to flavor each fillet. Others advocate a mayonnaise-based topping, or a teriyaki soak, then wrapping the fish in foil and steaming it on the BBQ or in the oven. I have tried countless other salmon entrée recipes, usually on the days when it’s too stormy to send the Capt outside to man the barbecue. I’ll panfry the odd bits and trimmings in butter for breakfast, sprinkled with a hint of salt and pepper, but the real deal is the Capt’s two-step, on-the-barbecue special with sauce. This has been a family favorite for so long we can't remember where or when the recipe originated. You can't really see the special sauce, but trust me, it makes a difference! Another guilty secret to share: I adore any leftover salmon cooked this way. It’s a great addition to a Caesar salad, makes a tasty salmon spread, and adds a special note to several soups, pastas, and fillings for crepes or omelets. What’s more tempting then the buttery richness of fresh salmon mixed with the salty tang of bacon? All of the above quantities will always depend on the size of the fillet, so we adjust to fit the fish. Begin by cooking the bacon in a small saucepan, just till it begins to soften and ooze fat. * Add a bit of butter, if needed, and the scallions and simmer a few minutes longer. Add the rest of the ingredients and cook over low heat to blend flavors. Grill salmon fillet, meat side down, for about 5 minutes to seal this side. Turn the fillet over, spoon on the sauce and cook covered until fish is done (time depends on thickness, but NEVER overcook fish). If the fillet is very thick, baste with sauce again after a few minutes. Note: we LOVE the topping and leftover fish on salads and in sandwiches so I always make a large batch. *Capt’s Note: he’d prefer the bacon cooked until crispy, then add the rest of the ingredients. Who can argue with the barbecue chef? Hooray! We enjoyed an unexpected day of sunshine on Tuesday, and it was glorious. It’s almost worth waking up before 5:00 a.m. when you can look up through the overhead hatch and see blue sky. No clouds, no raindrops, no fog, just BLUE SKY! The wind had kicked up again, but we were snug and sheltered, anchored well inside Baby Bear Bay (link) and out of the chop. Sunny days deserve a celebration, but who wants to spend time in the galley when there’s so much to enjoy outside?! On this day an unseen woodpecker filled the air with his irregular staccato beat. Eagles soared, to circle and swoop down to the water’s surface, warbling their silly trill when they missed their targeted prey. There was wildlife watch, the constant scanning of the brush and shoreline for movement, hoping to spot a bear or even a deer or marten. Fishing, exploring, putting down crab or prawn pots - oh wait a minute, this is the cooking blog, not the cruising notes. We were just 1.5 days and thirty miles out of Sitka, so the refrigerator and pantry were well stocked with fresh produce and other goodies. 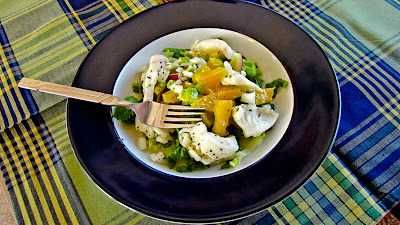 Alaskan seafood is always a treat so the celebration menu featured Halibut Ceviche Salad with Avocado Orange Salsa. I’ve made ceviche before, but usually with a mango salsa. Now I’m a convert to a citrus version with oranges instead; it still adds a sweet note but just tastes fresher. Another change this time was due to my not paying enough attention to the directions. I forgot to add the halibut to the salsa ingredients and plated them separately, first layering greens then salsa and topping that with the ceviche strips. Does it sound like I sipped the tequila instead of drizzling some on the food? No problemo, the dish was still delicious. Note from the Capt. - why bother cooking halibut any other way when this is so good?! Note from the cook - we enjoyed a second night of halibut ceviche, this time with everything done according to the recipe directions. It was served as an appetizer, and was every bit as good as the previous salad offering… even on a cool, drizzly day. Slice the halibut 1/4” thick into cubes, slices, batons, etc. In a glass or stainless steel container combine the marinade ingredients. Add the halibut and toss gently to coat. Let the juices cover the fish completely. Cover bowl and refrigerate for approximately 4 hours (until the fish is opaque throughout). Drain off the liquid, but reserve 1/4 cup of the juices. In a large bowl, mix the chiles, red onion, orange sections and juices, cilantro and cucumber. Gently stir in the halibut; season to taste with salt. Refrigerate, covered, until ready to serve. Just before serving, gently stir in the diced avocado and 1 to 2 tablespoons of the reserved juices. As an appetizer, set out the ceviche in a large bowl surrounded by tortilla chips, fill a martini glass, or pile the ceviche onto chips or tostadas. Garnish with cilantro leaves. As a salad or entrée, line a flat bowl with shredded greens and mound the ceviche in the center. Capt. Ron recommends topping the ceviche with a splash or two of tequila. Garnish with more cilantro and serve with crispy tortilla wedges.